1066 is a wargame of intermediate complexity, designed by Joseph Miranda, simulating the historic struggle to gain control of Britain during that crucial year of the 11th century. That struggle saw the Anglo-Saxons, under King Harold, defeat the Vikings, only to in turn be defeated by the Normans from France led by Duke William. His victory eventually led to the establishment of the modern British nation. 1066 can be played by two, three or four, each representing a different side: Anglo-Saxons, Normans, Vikings and Britons (the latter representing an amalgamation of the various peoples then indigenous to the island). Each of the 12 game turns represents a calendar month. Each fully iconic, large-size, unit represents roughly 1,000 to 5,000 fighting men or key individual leaders along with their elite 'household' troops. Each square on the 34x22" map represents 40 miles across, with all of England, Wales and southern Scotland, as well as the north coast of France, depicted on it. Each player has a variety of military and political instruments with which he can attempt to gain control of Britain. 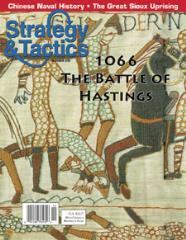 Every tactic and stratagem available historically to the would-be kings of England – from diplomacy through treachery, the laws of fealty and homage, vassalage, appeals to the Pope, assassination, pillage, shield walls, fortification, heavenly omens, gold, spies, rebellion, navies and, of course, savage warfare – are again in play here. The game contains one scenario, with adaptive rules that allow it to be played by two, three or four opponents. The rules contain approximately 14,000 words, which will allow experienced players to get through a complete game in about four to six hours.